Ted’s working years were spent helping people to relocate overseas. He took early retirement in December 2004 and pursued his ambition to be a Toastmaster. He is a highly valued and respected member of our leadership team, officiating at all our formal events. 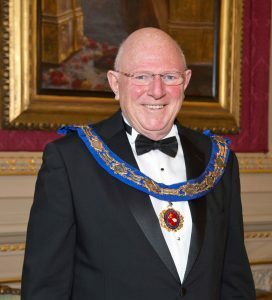 Ted says, “My duties as Beadle are ‘to attend to the Master, Wardens and the Court of this Company on all lawful occasions, properly robed and bearing my staff of office: to guard the door of the Court Room against intruders, to carry messages, serve summonses, to collect fines levied for blasphemy, cursing or reproachful speaking and, in former times, to execute whippings as punishment for offences when ordered by the Master. Also, I protect and identify the Livery on attending Common Hall when voting for the Election of the Lord Mayor, Sheriffs and other Officers of this City.